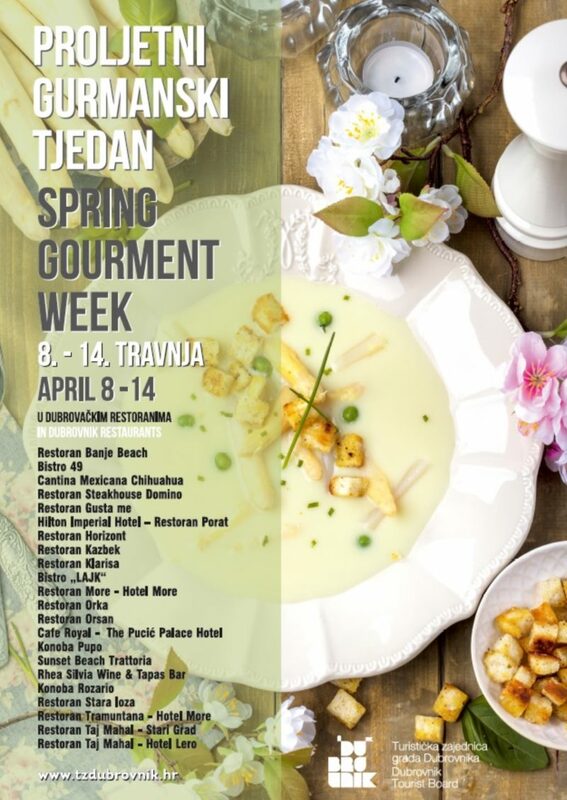 With the blue skies of Spring knocking on the door comes the Spring Gourmet Week - a gastronomic event organized by the Dubrovnik Tourist Board and Dubrovnik restauranteurs, Spring in Dubrovnik is reserved for enjoying the rich, imaginative and tasty specialties prepared in Dubrovnik restaurants from the 8th to the 14th of April. Just a few of the varied specialties inspired by fresh spring foods are asparagus and truffles with crunchy pancetta, creamy onion and kohlrabi soup, an orzoto with asparagus and shrimp, a carpaccio of cold smoked tuna and swordfish on a bed of fried rocket, chive and spring onion with pistachio emulsion and a citrus fruit pesto, homemade asparagus salad with hard boiled eggs and many other dishes designed and created for this year's gourmet experience. In this gastronomic event, there are 22 restaurant facilities including Restaurant Banje Beach, Bistro 49, Cantina Mexicana Chihuahua, Restaurant Domino Restaurant, Gusta Me, Restaurant Porat - Hilton Imperial Dubrovnik, Restaurant Horizont, Restaurant Kazbek, Clarion, Bistro LAJK, Restaurant Orka, Orsan, Cafe Royal - The Pucić Palace, Konoba Pupo, Sunset Beach Trattoria, Rhea Silvia Wine & Tapas Bar, Tavern Rozario, Restaurant Stara Loza, Restaurant Tramuntana, Taj Mahal - Stari Grad and Taj Mahal - Hotel Lero. For more info visit https://bit.ly/2TSct8Q .